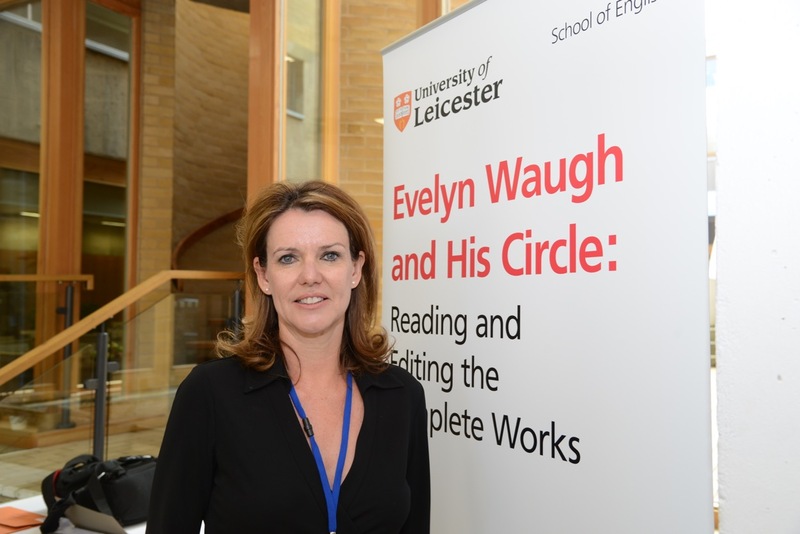 Last month saw the international conference – Evelyn Waugh and His Circle: Reading and Editing the Complete Works finally come to fruition. It has been a common topic of conversation ever since I started working on the project in January 2014 but had always seemed strangely far off and abstract in the way big events like this seem to. It all became concrete however when, about six weeks before the conference, I started to help Barbara with various admin tasks; getting in touch with delegates and keynote speakers, compiling information, booking our photographer and things of that nature. 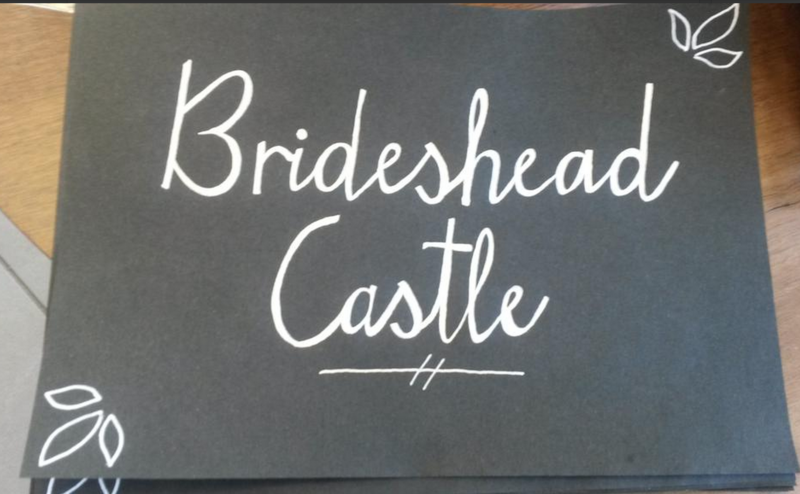 I even ended up hand drawing the table settings for our Gala Dinner! This took several hours and gave me a really horrible cramp in my arm so is not something I would generally suggest doing! I got up bright and early at 6am on the first day of the conference and didn’t really stop moving until the Sunday lunch three days later! On Friday morning Ben (my partner) and I made our way over to College Court, the University of Leicester’s dedicated conference centre, in just a tiny bit of a hurry, but when we arrived everything seemed suspiciously calm! Ben was whisked away almost immediately to set up cameras and dictaphones as he had been kind enough to volunteer his AV expertise over the weekend. It is particularly important, on a project of this size, to record the thoughts and issues raised in sessions as these things can be very difficult to remember otherwise, and we hope that the editors will be able to make use of the recordings if they need to once they are uploaded to our Soundcloud account. Then I was helping out for a few hours on the registration desk for the rest of the morning, making sure that everyone knew where they were going and had all the information they needed. In the evening we were provided with a great meal and it gave everyone a chance to relax a little and talk about their research, and there was certainly a feeling of relief that the first day had gone so smoothly. On Saturday I was able to attend Selina Hastings’ keynote talk in the morning about the correspondence between Waugh and Nancy Mitford. Everyone agreed that Selina brought the letters to life wonderfully, what I found particularly touching about them was how involved Waugh became in Mitford’s creative process, offering a great deal of advice about editing Love in a Cold Climate. Then I attended an excellent parallel session on the topic of ‘Uncertain Times’ which had three great papers all touching upon A Handful of Dust. It all went amazingly quickly and before I knew it something I had been dreading/getting excited about, giving my very first paper at an academic conference, had come and gone. 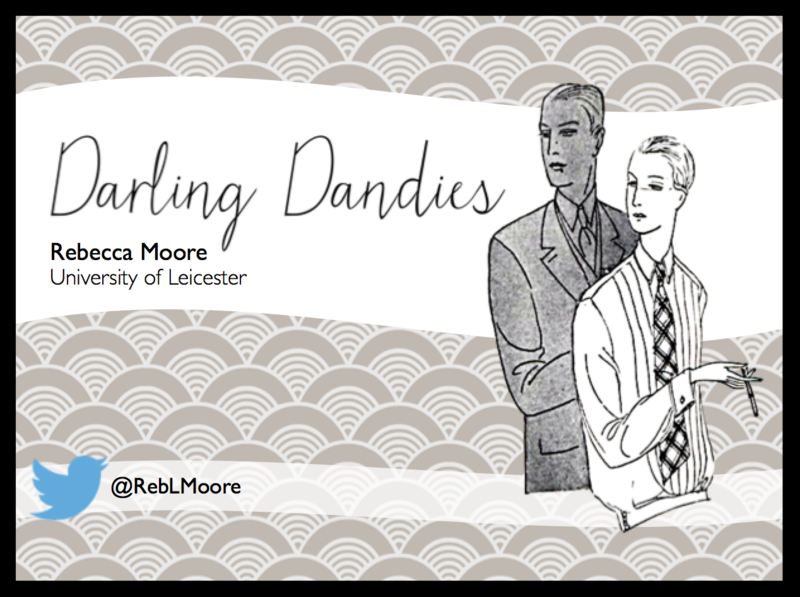 I had been working on my paper on and off for some months beforehand so it wasn’t too stressful to put together into a presentation with accompanying Powerpoint slides – I spent quite a while beautifying them…. hopefully they were admired! The first slide from my presentation, ‘Darling Dandies’ which dealt with three of Waugh’s dandyish female characters. 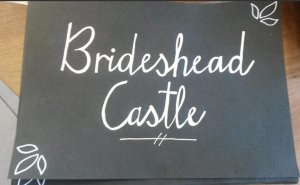 I have found, actually, that searching for accompanying photographs and illustrations can be a really fruitful way to research a project, as they tend to throw up unusual avenues of enquiry you might not have thought of when compiling a traditional literature review. 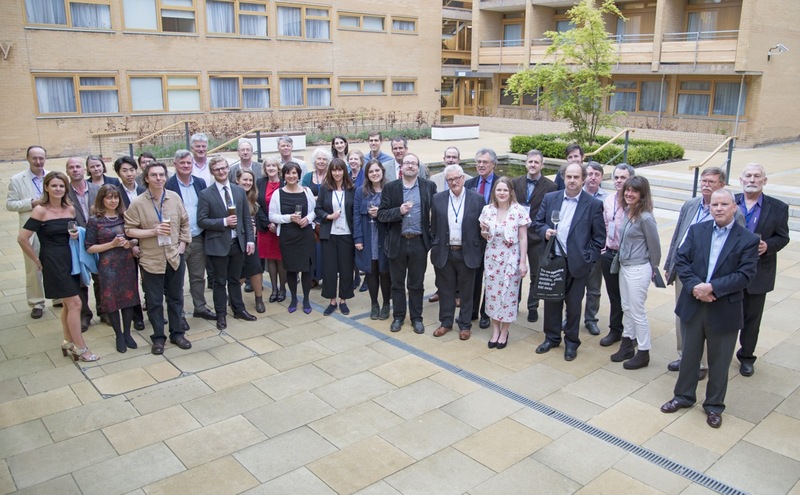 I do enjoy presenting but I was nervous about speaking in front of so many eminent and experienced Waugh scholars in case I made an enormous blunder, but luckily I didn’t, and anyway, the atmosphere at this conference was overwhelming supportive. Indeed, something that came up a great deal over all three days was the ability to pick up little bits of supporting knowledge from audience members and other panellists – a way of sharing knowledge that I think is quite unique to the conference environment. 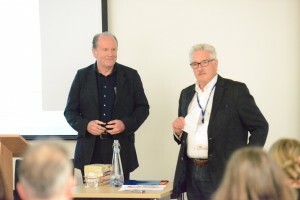 Martin Stannard introduces William Boyd before his Saturday evening keynote. That evening we were treated to another keynote speech, this time from William Boyd, who talked about his favourite clips from his adaptations of the Sword of Honour trilogy and Scoop. It was really fascinating to learn about the difficulties of adapting Waugh’s humour for the screen – particularly the famous ‘Great Crested Grebe’ joke in Scoop that had to be cut from William’s version as it was impossible to film! Also I think William’s quote that ‘Writing a novel is like swimming in the sea, writing a film is like swimming in a bath’ was my favourite of the whole weekend. Following this talk, and after a brief break, everyone glammed up for the Gala Dinner and many delightful hours were passed between the dining room and the bar that evening … I have to say I had rather a late night but I enjoyed every moment! 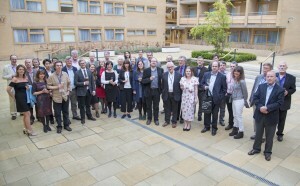 Waugh Conference delegates outside our beautiful College Court venue before the Gala Dinner! And then, all of a sudden, it was the final day! I attended another super parallel session on the topic of ‘Works of Faith’ with a paper about Waugh’s report on ‘Church and State in Liberated Croatia’ and another on his correspondence with Trappist monk Thomas Merton. Paula Byrne ahead of her Sunday afternoon keynote. After a brief stop for tea and coffee (I was definitely running on quite a lot of caffeine by this point!) it was time for our final keynote from Paula Byrne. 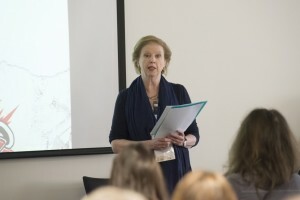 Paula gave us a fascinating, and, at times, incredibly moving talk about Kick Kennedy, including correspondence she had with Waugh about her Catholicism, pointing out some parallels between Kick’s life and Brideshead Revisited. There was a slight air of melancholy about the lunch which followed – many delegates had already begun to leave and Barbara and I had to start thinking about packing all the roll-up banners and conference ephemera away. It had been an incredibly busy, physically and mentally tiring weekend, but I really didn’t want it to end! It was wonderful to meet and speak with people whose research I turn to so often when writing my thesis, and as a PhD student, to get the experience of not only presenting at such a prestigious conference, but also to help with the running of it was invaluable. Thanks for this Reb, and for all your hard work! Beuatiful slides. Our conference videos are now available on the project’s youtube channel. Thought I remembered everything – turns out I didn’t, so really useful to relive everything here. Leave a Reply to Barbara Cooke Click here to cancel reply.